Fast moving and packed with intrigue, The Music Book reveals the dark and secret world beneath the veneer of 18th-century social glamour. 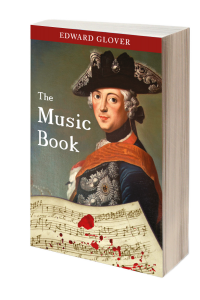 The Music Book takes us into the relationship between Arabella Whitfield and Colonel Carl Manfred von Deppe as they escape the dark demi-monde of mid 18th-century London, becoming fugitives pursued across Europe as they search for fulfilment. Arabella Whitfield: the young daughter of a wealthy Norfolk landowner, who suddenly leaves her comfortable home in February 1765 to avoid the marriage arranged by her father, believing that women should have the same rights as men. Amongst her few possessions are a treasured music book, containing transcriptions of pieces by Handel and Bach, and a mask to hide her identity. She stood transfixed, gazing at herself through the mask, barely breathing. She was no longer Arabella Whitfield of Meltwater Hall. She had become a mysterious young woman in a high-class brothel in London, about to lose her virginity in a way she had never imagined. Her eyes began to fill with tears but they were hidden by the mask. The thought of what she had agreed to do – to join Mrs Hallam’s household – filled her with horror. Men touching her body . . . It made her nauseous. But this, it appeared, was the price she would have to pay for her independence. Yet oddly, in her kaleidoscope of emotions, she felt a momentary tingle of excitement at the thought of pretending to be someone else; experiencing in anonymity a different life, to see where it might lead. After all, it would only be for a while, she told herself. Arabella almost giggled for a moment, but then once again plunged back into despair. Her body was about to be used for the pleasure and financial benefit of others. She had read about whores and courtesans. She was about to enter their world. She was filled with terror. Colonel Carl Manfred von Deppe: a former senior military officer sent to England, accompanied by a mysterious stranger, by King Frederick the Great of Prussia. His orders are to avenge the betrayal of one of the King’s most intimate friends years earlier. The old man turned his gaze on Carl Manfred, as though imploring him to save his life. Carl Manfred had often seen that look of terror on the battlefield, seconds before he wielded his sword or lance to despatch a fallen foe. He had been taught that there was no mercy in Frederick’s army. A spared enemy could cost you your life in the next battle. So he had learned to show no pity. It was either your opponent’s life or yours. Accordingly, if this rule still applied, there could be no mercy for the man in the cellar. The King had given his order; it could not be countermanded. Carl Manfred turned his eyes away from the old man’s beseeching face. He heard the sound of a door opening in a dark recess to his right, behind the staircase he had descended a few minutes before. From the darkness emerged the stranger. When Arabella and the Colonel come face to face, their fates intertwine in a story of intrigue, betrayal, revenge, death and redemption. As Arabella eventually breaks free from her sordid world, and Colonel von Deppe and his travelling companion exact King Frederick’s vengeance, they become fugitives pursued by enemies and finally escape to Paris. The brutal game continues in a bleak and dark German winter wilderness, and plays out in the royal palace of Sanssouci. The young woman’s music book – one of her few treasured possessions – is witness to the unfolding scenes.